Hello there, my name is Matt Ouellette and I'm originally from Vancouver, BC, Canada. I've been living down in Puerto Vallarta now for approximately 10 years pretty much full time and I love it. I work in real estate and as an AMPI member I belong to the national association of proffessional real estate agents of Mexico. I'm presently working for Grupo Real Del Mar (the biggest developer in the Bay of Banderas-Greater Puerto Vallarta areas). I purchased this unit cause of location, location, location. 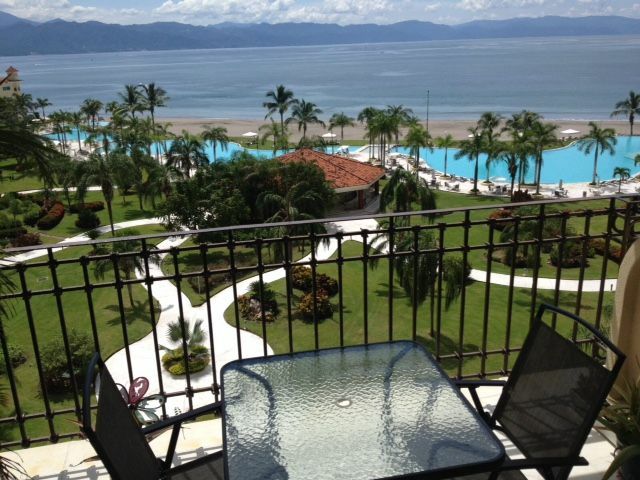 It is located in the up-scale Marina Vallarta area of Puert Vallarta and is 5 minutes from PV's international airport. It has views at the front of the ocean and beach and at the back of the Sierra Madre mountains as well as the Marina Vallarta Golf Course. Every day you're overlooking the ocean and beach. You get a nice, soft breeze off the ocean with that lovely scent of ocean-sea water air. I also love be surrounded by the lush green jungle-like areas of Puerto Vallarta with the fresh aroma of plant-life. Really nice place to stay close to everything great pool and good food and service at the pool very qwiet . We loved our stay at the Bay View Grande. Matthieu’s place was clean and well care for. We would definitely return. A good place in a great location. A few dollars would go along way in upgrading this unit. A new shower faucet, a few more towels, a new mat for the bathroom, better fitted sheets, would really go a long way. And a little more toilet paper on arrival. It’s a large size unit with a big screen TV, and good wifi including the pool area. But there are very few English channels. The building, is in good location. 15 minute walk to the Marina, 20 minute walk to the supermarket. Great pools, grounds and gym. Yoga classes available. The crowd is a mix of permanent residents, snowbirds and some locals but mostly 70+. Great beach walks on both directions. Bus service is right at the gate. Good communication with owner and manager. Wonderful stay, with amazing views! We loved it, very clean and modern, not to mention spectacular views!! Quick access to private beach and pools. Definitely will stay here again. Matt our host made us feel welcome and gave us tips to some great restaurants. This complex is beautiful just like the photos. The condo has a beautiful view, it was clean and quiet. Our stay was very enjoyable. We rented this condo for a relaxing week in PV after a hectic two weeks with family and friends elsewhere. The unit was as described - clean, modern and in a great location. The grounds and pools were kept immaculate. It was about a fifteen minute walk to the Marina where there were lots of excellent restaurants. Would recommend this unit to couples only however.